OWH Stars and Stamps (Our OLD blog! ): OWH Bunny Hop: Start here! OWH Bunny Hop: Start here! This is the first stop on the hop - and we are SO excited! These events are always so full of excitement...so go get a nice beverage and a snack, get a paper and pencil to jot down ideas you want to return to...and let's get started! BLOGGERS: Please allow comments by "anyone" on your blog, and turn off WORD VERIFICATION and MUSIC. Let's make it easy for folks to leave you some love! Note that this is a really long hop! It will take a long while to hop through them all. Blog posts will stay up all weekend, but the longer you wait, the more likely that a new post will go up, and you may need to scroll down to find the bloghop post. Links in the list at the end of this post will be updated to take you directly to the bloghop post, but that may not be til later in the weekend. For those new to OWH, we want you to know our St Patty's Day card deadline has passed; our EASTER deadline is March 18th - getting the cards to a shipper sooner is preferred though. Mother's Day cards are due by March 31; you'll be able to catch all the deadlines and download an OWH calendar here. Here's a little spring inspiration for you - these cards were made using a new digi released on our blog yesterday, generously drawn for us by an OWH cardmaker, Fran! Today we're giving away not one, not two, but THREE packs of goodies! We'll draw winners randomly from all comments left on this post. The next blog on the hop will be the Hero Blog! List of all blogs: These now go to the specific post, not just the top of the blog! 7. Dixie , What's Next? 20. Cindy, Cindy's Card Co. Woo Hoo, its finally time to start hopping!! Looking forward to lots of fun, ideas. Good morning! I thought I was the first to comment, hehehe Hey, my card is on this post, what a fun surprise :) Have a great weekend it's time to hop on! Thanks y'all for your hard work! Thanks for hosting another great bloghop. I am so ready to Hop, Hop, Hop!! thanks OWH for everything you do! I am honored to be a part of this hop and can't wait to see everyone's cards!!! I am so happy to participate in another great OWH Bloghop. Thanks for hosting and keep inspiring. Thank you for doing this. It is such an inspiration to us all! My post is up and I am busy hopping! Thanks for allowing me to contribute to this great hop! Thanks for hosting this bloghop and thanks for all you do for our troops. You are the best!! Wow thats a lot of hopping. :) I think I will be making cards today and hopping around at the same time. Maybe I will get in on the next hopping adventure! OWH hops are ALWAYS one of my favorite events. There's such an outpouring of love and inspiration and I meet the NICEST people along the way. Can't wait to get started. And thanks OWH for putting this fabulous event together for us to enjoy! I have to work today but will be back to catch up---can't wait for the inspiration!!! Everyone here is such amazing card makers!!! :) Denise I. Have never done a blog hop before, so this will be my 1st & so looking forward to all I see & learn. Thanks for the opportunity! Love how many people are participating. The blog hops are so fun, I always end up following a couple new blogs! And a fun way for us to feel like a community. Thanks for the chance to win some blog candy! You guys rock! Particiapting in the Soul Restoration bloghop this weekend, so am just here for the ride this time... Love you guys so dearly. Your mission makes the world a better place. Woohoo, I'm so glad I have today free from schoolwork so I can hop! I wasn't even going to participate and am glad I signed up at the last minute. OWH is my inspiration! 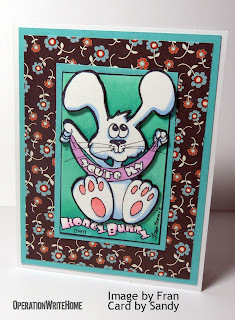 Cute cards---makes me think I need to get busy with Easter cards! What a fun blog hop. Great projects! TFS! This is my first OWH blog hop. I am so excited to make cards for such a great cause!!! Those cards are so cute!!! Love that little bunny! I can't wait to see all the stops along the way today. Thank you for putting this Hop together! 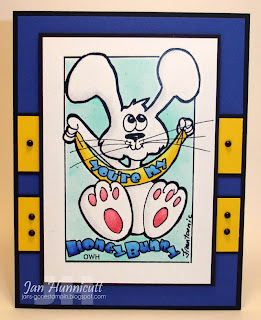 I can't wait to see all the great inspiration along the bunny hop! Yolanda...thanks so much for setting this up. Thanks to all those who have blogs. I can't wait to CASE ideas! Let the fun begin! WOW! There's A LOT of blogs--will be fun! What fun this will be! Love the little spring cards you showed! WOW! I can't wait to get started, there are TONS of blogs to start stalking! Thanks for everything that you do. Getting Ready to HOP HOP HOP and HOP some more. I can't wait to see all the wonderful inspiration. WOW! SOOO many blogs on this hop! I know where I will be ALL day today! And knowing the creativity of the OWH crafters I expect to bookmark many many posts to case later! Hippity Hoppity I'm off!!! Looking forward to all the blogs on this hop!! A day full of inspiration! It's FINALLY here!!! I've been waiting for this all week! Thank you, OWH, for all the wonderful ideas and tutorials!! Way better than coffee to wake up to this morning!Cards-cards and more! Wow! What a long list of hops! Cant wait to get started. Here we go! 135 blogs to visit, whew! Sandy and Jan, love the cards you made with Fran's digis. Everybody enjoy the Bunny Hop! 1st stop is already looking great! hOPPIN ON DOWN THE LINE ! Thanks for another great hop and lots of ideas. Thanks for all the hard work setting up the hop! This is my first Hop here. I'm looking forward to seeing lots of great cards! Stopping by to WISH you all a wonderful Hop! I'm not able to complete the hop (too long for this Fibro gal), but I will do my best to make stops at random blogs and wish you all well! Thanks for setting the hop up! So happy to be 'hoppin. Looking forward to some great inspiration today! This is my first time being a blogger in a blog hop!!!!! Love it!!! Time to start hoppin' along the bunny trail!!! Can't wait to see all the lovely creations!! Love the blog hop. Thanks for doing another hop. It will take all weekend to get thru it. Yea! wow - 135 blogs to hop at. Should I start now or wait until I've made some cards...such a dilemma. I think I'll make a few cards first and then start hopping in a little bit. Can't wait to see all the awesomeness you ladies have created. This is my first OWH Blog hop. I am ready to go! So excited about hopping through all the blogs. WooHoo....here I go! Looking forward to this hop! cool--looking forward to hopping and being inspired. Just home from work, ready to hop! Thanks for everything you do! I know that all the troops like the support!! Sooo EXCITED for this! What a SUPER way to start off a weekend! So many blogs to hop!! Not sure if I can get through all of them!! I love blog hops! This is just the distraction I need today! Thanks! Your card is so cute. I love the digi bunny. With so many blogs to visit I don't think the house will get picked up or the kids fed. I will try and squeeze it in. Thanks. I love the bunny cards! So super cute! I am ready to hop! Your bunny cards are cute and you folks are wonderful!! Thanks for hosting the blog Sandy, and I'm so glad that Frantoonie made the beautiful digi stamps for us to use on our OWH cards. She's so awesome! Thanks so much, lots of great ideas! Wow, what an awesome way to find new blogs. Thanks so much. Thanks so much for hosting another wonderful blog hop! There are always soooooo many ideas out there! Hopefully too we will get a few more supporters for OWH. Great job!!! I'm glad you have so many stampers participating. It may take me a couple days to visit all of them. Thank you for all you do for the troops. I always look forward to these hops, and I can't wait to see what's in store for us today. Many thanks to you ladies behind the scenes, the bloggers and especially the hoppers for making this such a wonderful hop to be involved with! Great hop! This is so much fun! Thanks for putting this together! I have got to do that bunny digi! I love the bunny card, Really cute. THis is my fist encounter with OWH. So glad I am doing the hop. Can't wait to find out more. Wow lots to read in this Hop but I will make it. Thanks for hosting, now to get hopping! Love the bunny! Thank you for putting on another blog hop. Wow! Lots of hops but, looking forward to some great ideas! What great cards. I'm excited to hop. I'm new to OWH, so this is a very exciting hop for me. I'm working on my first shipment trying to get it out before the 18th. Looking forward to all the spring inspiration! Yahoo -- GO OWH! OWH is so great in so many ways. I am happy to beable to give back to our soldiers in making cards that they can use to send to love ones. Your cards are definately one of a kind!! I love Fran's images. They're adorable! This is so much fun! Thanks for all the hard work that went into organizing it! This was so much fun I'm going around again. This is my first blog hop. I'm looking forward to it. Uber cute digi and fantastic coloring! So excited about my first hop and look forward to doing many more with a less enthusiastic, crazed system! LOL! This hop is so much fun, I hope I win. About to get started on the blog hop! I love these, they are so fun and inspiring! what a fantastic list of blogs to hop today! Love your cards and thanks to Fran for the art! Awesome! Can't wait to get started! Wow, this is some serious HOPping to be done today! Looking forward to all the inspiration on the way!! Now this is what I call a blog hop. Such a worth while blog, thanks for the chance of visiting your blog and for the chance of joining in with the hop. Woohoo! Thanks for the opportunity to participate in the bloghop - my first ever. Sandy, you are the best! WOWZA what a great hop this is! PLEASE if there is a way to let everyone know that #30 is indeed UP and running I would so appreciate it. Cute, Cute bunny cards! What an awesome hop!! Thank you OWH! Looking forward to lots of inspiration! This it the first time I've gone hopping through these blogs - thanks so much for organizing it! Wow - I'm just now visiting the Blog hop sites. I got an invite from a friend to attend and I must say I NEVER knew what kind of caring and compassionate work was being done out there. All of you who are involved with OWH are awesome! What a great thing to start for our military personnel! I plan on joining in on this as well to do what I can! What a nice blog hop too! What a wonderful experience to hop with OWH. I'm so honored to be in the presence of such great card makers! WOW!!! What an amazing hop! Kicking myself that I didn't sign up in time. Next one!! Thanks for all you do OWH! So excited to see some great ideas! This is going to be fun! Those bunnies are adorable. It certainly was generous of Fran to make those digis! Thank you for all the inspiration! I'm just getting started on the hop and can't wait to see all the eye candy. OWH is a wonderful cause. Thank you so much for all the love and time you donate. That Bunny is soooo cute! I love Fran's images! Great cards to start the hop with! Great hop - love the creations. I've been out all day and just getting started here this evening.. These bunnies are so cute...thanks. Off to a long night of hopping. Love your cards! I love OWH...getting cards ready to send this weekend. Thanks for hosting such a great hop! I'm so excited that the blog hop is finally here! Jan and Sandy, your cards are sooo cute. I can't wait to use those darling stamps that Fran made for us. What a great way to get started on my new adventure. Thanks for all the bloggers, the ideas and the support. 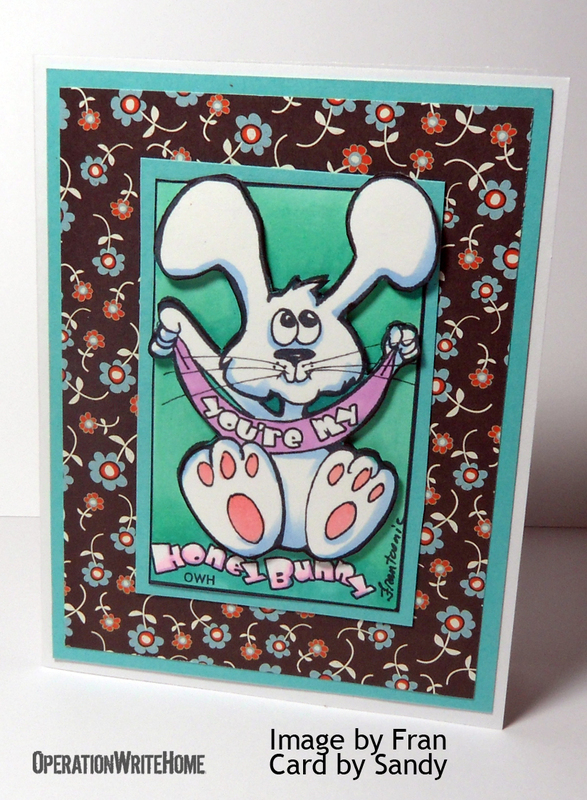 Love the bunny card with patterned paper! I'm determined to get through the entire hop this time. This is so great. Thank you for doing this hop. Looking forward to the sites. This is my first attempt at a bloghop. I am sure I won't have time to get all the way through, but I am sure it will be fun regardless. Once I see what it's about, maybe I'll actually post on the bloghop next time. No promises though. Holy Moly! What a hop you gals organized! I know I'm late, but I'm here to play! I have 42 to go, but I'm still hopping along! Just found out about the hop, got alot of catching up to do. Love your Bunny Cards. Thanks for hostessing. I am really enjoying the hop. Thanks! Thanks to everyone behind the secenes and Sandy, Kris and Dixie for all you do. Okay, then. It looks my evening is booked going to all the blogs. :) Off to have fun. This must be a world record for the largest blog hop! I've done some and now I am here at the start to see what I've missed! Wow you weren't kidding when you said the hop is a long one! I am new to this site and it looks like an awesome program! Hope to jump in soon real soon. I'm under the weather. This is a wonderful idea. Thanx for the inspiration and blog candy opp! this is a huge hop!!!! Love the cards! I love blog hops! I get such great ideas from very talented women! Wow, you're not kidding it is a long blog hop. Hope I get through it ! I think i'll wait to morning to hop. We are working on cards again and should get them sent out by 3/31. Have a wonderful Day… HOPPY Easter to You! Wowsers!! Thanks for the opportunity for some sweet blog candy!! What a joy to be a part of this awesome organization! Thanks for all you do!! Just found your blog and I have to say that this is a wonderful place to get inspired. Thank you for all the hard work and dedication to those who serve our country. Such a fun hop and a great way to get the word out about OWH- I am slowly getting thru all of the posts! Wow, I think this is the best hop yet--so much to see and be inspired by! Thank you for this great blog hop. What a great opportunity to give back to those who serve our country and protect us daily. What a fun hop & a great cause. TFS! Fun Hop! TFS you great blog. Love your work!!!! Wow, what a list for the hop. Wish the weekend was longer! The blog hop was great. 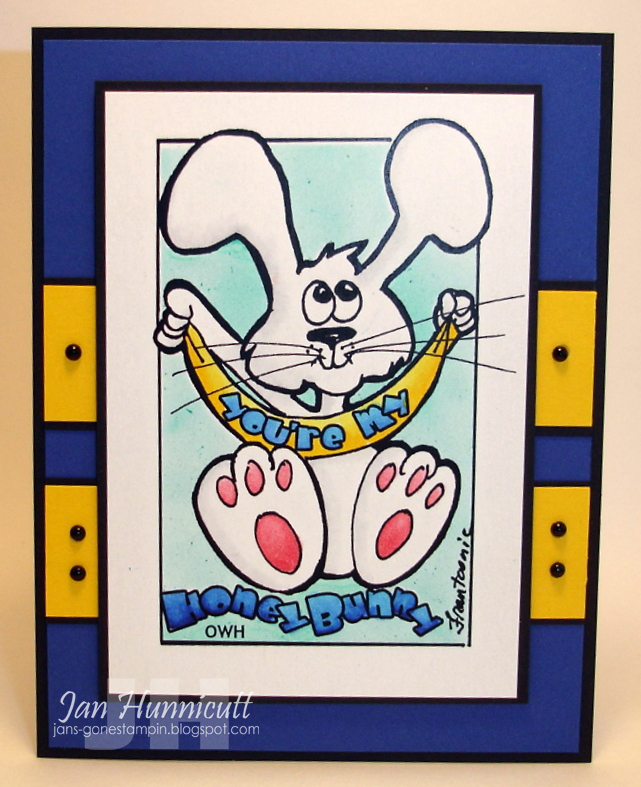 What fun cards you created with Fran's free digi! I love your blog hop. i didn't get to play this time, but hoping I can next. I just stumbled on your site. What a wonderful idea! Can't wait to get my stamping group involved. Wow what an amazing hop. I started somewhere in the middle so not done yet but I'm blown away by all the talent and by your mission. I'll be making some cards for OWH ASAP. Just getting started and guessing I won't make it through everything. Looking forward to seeing some great creativity. An awesome event... I'm sure I won't get to make to all hop stops in time for entries, but it will be a blast to visit everyone! Thanks Yolanda for organising it for us! It was awesome to be a hop stop in the event! I would just like to say "Thank You" to all that are doing this and making even the blog hop such a wonderful place to hop! Great prizes and thanks again for hosting the Bunny Hop. I had so much fun sharing my card and blog candy! Wow, what a huge hop. Love your site. Cute digi, too. I was out of town this weekend and am just now sitting down to hop! Thank you for hosting us this weekend - I look forward to lots of inspiration! Thank you for doing another blog hop and for letting me join!!! I love everything that you do for our troops - and for making it so easy for us to help. Just found this at 12:30 am. Wish I would have seen it earlier. Still gonna go through and visit everyone. Cool hop for a great cause. This is my 1st time to participate and will try to get the kids at school and/or church to get involved.What a great way to support our heroes! I thought I commented but don't see it. I know it is the 7th but will hop anyway. Thanks for hosting a great hop. Great cause. Thanks for all you do. I'm way late.... but I can't wait to hop through & see all of the wonderful inspiration!!! Stickles - is it ok? Sketch Challenge #62 - Special Edition! OWHtv Episode 4...and coming Saturday: Seminar!! Sandy's next idea: State digis! Melanie + GinaK + YOU = Amazing cards!